Last week we talked about how Jesus removes the stench of our past, and I wanted to return to it today. Because he doesn’t simply remove the odor, he replaces it with something of beauty; something fresh and clean. Hyssop was used in some very key points in the Bible; it's sturdy build and aromatic scent made it an herb often chosen. It’s no surprise that we see it here too in reference to cleansing us. And as a girl, I love this passage. See, there’s this huge business out there for all these pretty body scrubs and special soaps. There are stores that specialize strictly in this industry. And we women love it. Sure, we could take a shower with a bar of Dial soap and be clean, but we want to smell pretty. There’s just something about walking out of a shower not only spotless but with a fresh aroma radiating off of us. Do we really thing Jesus would do anything less with us spiritually? He is a God who loves to delight. He specializes in details. His love for you knows no bounds. So there’s no way he’s stopping at making us white as snow. Oh, that part is the amazing part. The extension of mercy and grace. The beautiful sacrifice he made to remove our sins from us because of his great love. And he could have stopped there. But he didn’t. 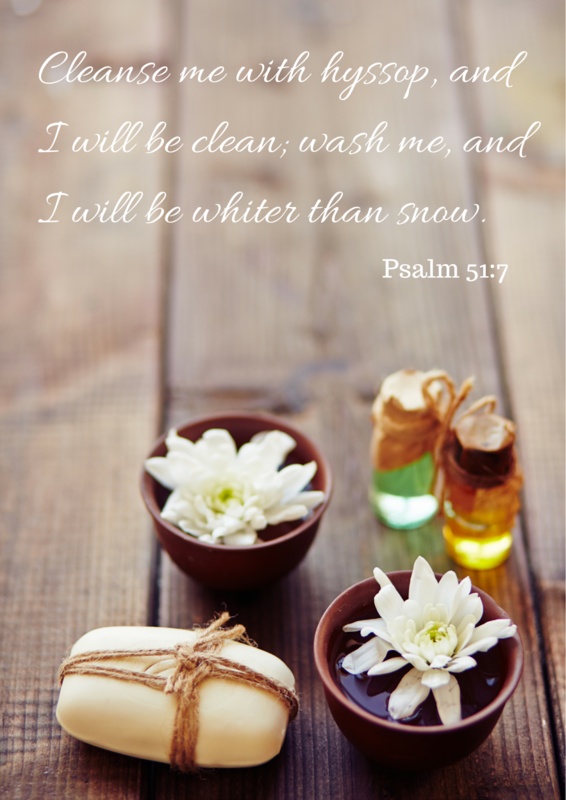 He covers us in a new aroma so that we are not only clean, we smell amazing too. Don’t ever doubt that the God who is crazy-in-love with you isn’t extravagant with that same love. He’s not a just-enough God, he’s an God of abundance. And his love is focused squarely on you. He’s removed your past as far as the east is from the west and then drenched you in a new scent that is pleasing not only to him but to those around you. Lord, today let me stop breathing in the smell of my past and help me to inhale the beautiful new aroma you’ve bathed me in. Let it fill my senses until the only thing I know is you. Help me to see the burning brightness of my new life in you and to walk in the confidence of someone washed cleaned by your love and spritzed by your spirit. Simply Beautiful, thanks for the reminder of our cleansing by a Heavenly Father. You are so welcome, Kari! Stopping by your blog always brings me a step closer to God. Have you ever considered seminary? Your insight is amazing.